The earth has shifted, at least in California. The statewide minimum wage increase to $15 is a huge victory for progressive forces. On Thursday the state legislature approved a sweeping plan to raise the minimum wage to $15 an hour over the next six years. It will increase the current $10 to $10.50 next January, then $11 the following year, and increase by $1 annually until 2022, then increase each year by the cost of living. The federal minimum wage has been stuck at $7.25 an hour since 2009. 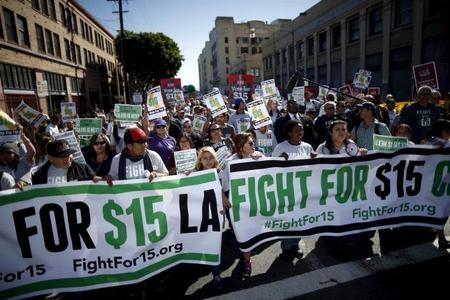 Twenty nine states and Washington, D.C., have higher minimum wages than the federal level. The hike to $15 will put California ahead of all other states. The new law will boost paychecks for millions of California workers. More than 40% of California workers earn less than $15 dollars an hour. By putting more money in people's pockets, the pay increase will improve the economy by increasing consumer spending in businesses throughout the state. The state Assembly approved the plan by a 48 to 26 vote, then the Senate voted for it by a 26 to 12 margin. All but two Democrats -- Assembly members Tom Daly of Anaheim and Adam Gray of Merced -- voted for the bill, sponsored by Senator Mark Leno of San Francisco and championed by Senate President Pro Tem Kevin de Leon of Los Angeles. No Republican voted in either chamber for the measure. Gov. Jerry Brown will sign the law in Los Angeles on Monday. "At its core, this proposal is about fairness," de León told the Los Angeles Times. In 1994, Baltimore adopted the first municipal "living wage" law, requiring companies with city subsidies and contracts to pay employers a few dollars more than the minimum wage. The idea quickly spread and, pushed by unions and community organizing groups like ACORN, more than 150 cities passed similar "living wage" laws in the 1990s and early 2000s. Most of these laws effected relatively few employees, but they helped change public awareness about the plight of the growing numbers of "working poor;"
The incompetence of the business community, especially the CA Chamber of Commerce and the California Restaurant Association, which was caught off-guard. Equally important is the public's growing hostility toward big business lobby groups that claim that every progressive reform -- consumer and environment protections, fair taxes, workers' rights, and others -- is a "job killer." Most people don't believe them anymore. These are the things that movements do when they are at their best.